Those were the days, but users upgrading from an iPhone 6 to 7, are in for a sticker shock, admits Tim Cook. Apple will be fine. Despite the unprecedented 15% drop in iPhone sales, its $19.97 billion net income is just shy of the record-setting $20.07 billion a year ago. Apple's cash pile grew to $245 billion, and the installed user base of iOS devices grew to 1.4 billion, paving the way for future increases in the already record-breaking services revenue which has the highest gross margins out of all of Apple's business segments. On the surface, even the high iPhone prices seem to have simply added to the market share expansion of premium phones which went up 18% last year, according to Counterpoint. Still, the top revenue number was less than analysts expected at the beginning of this past quarter and in line with Apple's unprecedented sales warning earlier this month. The net income, on the other hand, while the second-highest on record in Apple's history, saw a big boost from lowering the effective tax rate Apple pays. It went from 26% a year ago, to 16.5% now, thanks to the Republican Tax Cuts and Jobs Act of 2017, adding more than $2 billion to Apple's profits to compensate for the drop in iPhone sales. The Chief Financial Officer and the CEO Tim Cook himself listed numerous reasons for the perfect storm that is facing the industry, and iPhone revenue in particular - the White House trade wars and the resulting slowdown, US dollar strength that made iPhones prohibitively expensive in major markets, and even the mobile games ban in China that saw services revenue drop precipitously there. What caught our attention, though, is that Apple's CEO Tim Cook went way back to list the demise of US carrier subsidies as another reason for the tepid sales of Apple's bread-and-butter signature product. If you’re a customer that your last purchase was a 6S or a 6 or in some cases even a 7, you may have paid 199 dollars for it, and now the unbundled world it’s obviously much more than that. While that happened a few years back, he has a point, as, thanks to the low-cost battery swaps people are now clinging to their iPhones longer, and are in for a sticker shock when they see the new pricing. Herein lies the crux of the matter. Throughout the most part of its existence as a product, the iPhone sales had a crutch in the form of carrier subsidies in its largest, most visible market of North America, but also in China and other places. It's no coincidence that the US is the country with the highest iOS adoption rate, where half of smartphone users are rocking iPhones. In markets where carriers aren't subsidizing iPhones, Android handsets have been decimating Apple's finest for a while now when it comes to market share. 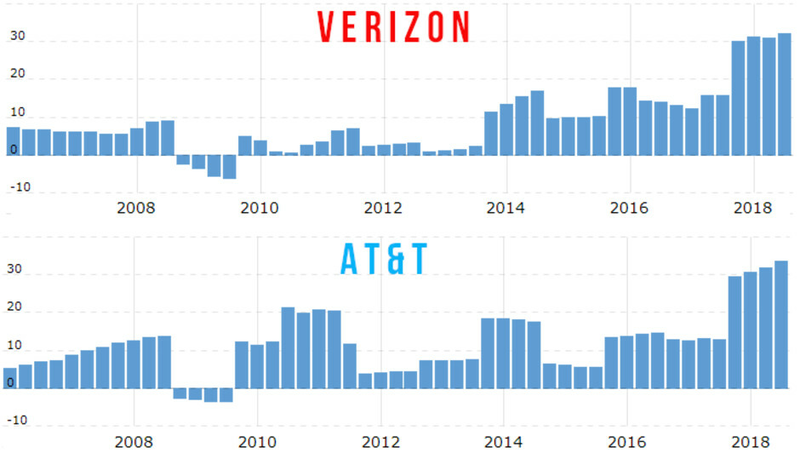 We plotted the profit margins of the two largest US carriers - Verizon and AT&T - against Apple's sales to gauge if indeed some of the missed profit opportunities for the iPhone maker went straight into carriers' pockets. The biggest Chinese carriers also started scaling on their iPhone subsidies way back in 2015, and the resulting switch to local value-for-money Android brands wasn't far behind. As usual in the local command economy, it was a mandated effort to favor domestic products, thinly veiled as a government request that Chinese carriers cut their marketing budgets by 20%. Beijing knew that would mean demolishing expensive phone subsidies given to the likes of Apple and Samsung's S- or Note lines. Before the move, $500+ handsets like the iPhone held 27% market share in China, and now Samsung's market share is almost non-existent there, while Apple's is greatly diminished, despite the iPhone being a status symbol in Asia. When carrier subsidies go, the iPhone goes, it seems, and Apple has little recourse to offset that but actually lowering iPhone prices, which it seems to be perfectly aware of, and is currently doing in China and other places, under the guise of "currency fluctuation adjustments." Don't think subsidies are that big of an impact. There are still many regions across the world where subsidies still exist. 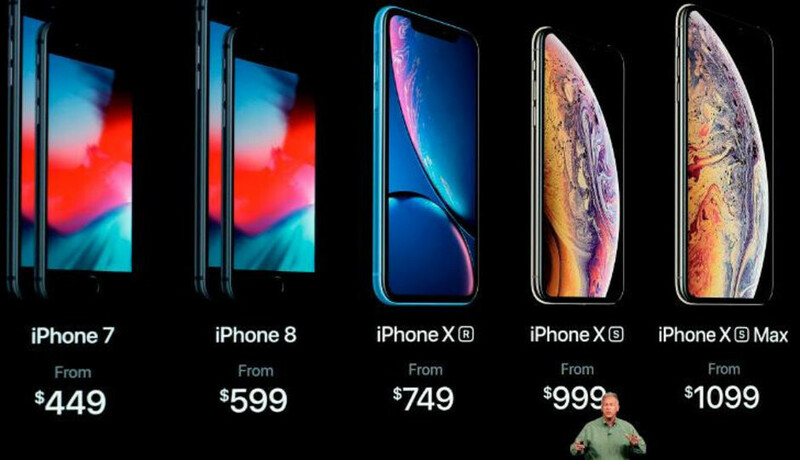 In Canada for example you could get any of the 2018 iPhones for $0 down at launch. Yes there is still the smoothing of payments reduced slightly by subsidies but most will ignore that for the no cost up front payment. When most carriers have to purchase iPhones as well as other smartphones from OEMs outright. Then they don't want to buy that many up front. Especially if those devices are sitting in their inventory. So carriers with the help of OEMs will put deals together in order to move and entice customers to buy their devices. It's not only the new iPhones going for zero dollars, but many others are going for the same thing as well. Some will give you free TVs with a new smartphone. Not to mention all the buy one, get one (BOGO) free deals. Plus some give you free gift cards, and more. We have heard it for years. This isn't new. The real problem with iPhones is all the crap afterwards. Like the Apple insurance rip off stuff (Apple Care). Buying quick chargers and cables for iPhones when everyone else includes that stuff. Not to mention the others include a lot more in their boxes. Apple charges you for everything else. People have caught on to Apple's greedy antics. For those who claim high iPhone prices are nothing to do with the decline in numbers of iPhones sold (you know who you are), read this report carefully. Same for those who denied carrier subsidies and leases did not help underpin iPhone sales, the same applies. Face the facts for once and stop apologizing for Apple and TC. Apple is not dead by a long way and price is not the only reason for this fall in demand, but Apple's greedy pricing in a difficult economic climate and lack of innovation while still increasing prices IS a factor whether you face it or not. Well said. The sticker shock and high prices are real together. 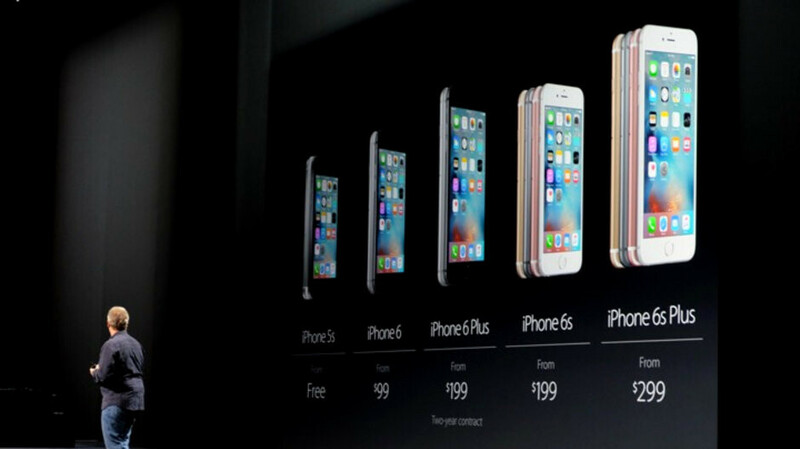 Apple just put themselves in the used smartphone business. that universe is not where Apple exists. Then, Apple tells me...Apple..that my 15 month old **256GB** iPhone 8 plus is worth $370.00 when I trade it on a new 256 GB Xs. They want my nearly new 8 plus and WHAT?!?! ; how much did you say?!?! Now, Apple is telling you how little your iPhone 8 plus is worth. They said it, not the carrier, not some reseller. Hell, Samsung will sell me a new 9 plus for $100 off and still give me $300.00 for the 8 plus. And, nothing for the extra storage. Apple users are now beginning to realize that they either paid **way too much** for the 8 plus or the Xs is **way overpriced**!! And Apple, no one else made this monster. IMO, one great thing that Apple could do is make SIRI work. I just watched a friend use SIRI today...what a joke. He just went ahead and typed into Google. Aye. And apple know how carriers offer their products. It's like making your friend sell your biscuits for $30 a box and hate him even if you know how he price it. For the past weeks, apple is giving their investors free baloneys. Apple still sells too many devices; it shouldn’t have a market share bigger than 15-20% - that’s Apple natural client base, everything over those percentages are temporary and volatile users. You live in a world of contradiction. One minute profit is everything, next it's selling too many devices! Then you say that Apple's natural client base is 15-20% of the market and everything else are temporary and volatile users, yet Apple has not had one quarter since Q4 2012 where its market share has been at 20% or above. In fact, it struggles to make the bottom end of your range and is currently well below that. This article reinforces all I told you just a few weeks ago and makes your statement "You are the perfect Apple hater: irrational, illogical, stubborn and stupid" and "You lack knowledge" look well irrational, illogical, stupid and proves I have knowledge beyond yours. Stating facts that disprove your thinking, just because you think Apple is always right, does not make me an Apple hater either. This article is about USA, not the entire world, and in USA Apple is still at (I don’t know exactly) 30-40%, which is way more than 20. I never said that profit is everything (I think I have never said that ever), you must have me confused. Apple market share all over the world was about the same, even though the sales have seen a drop in China, that means Apple actually grew in other markets (maybe in USA too, I didn’t followed the figures), so you have been absolutely wrong about pretty much everything you have said. Did you read the report or cherry pick? There are eleven paragraphs in this article only two of which are exclusive to the US. Just look at the final paragraph "When carrier subsidies go, the iPhone goes, it seems, and Apple has little recourse to offset that but actually lowering iPhone prices, which it seems to be perfectly aware of, and is currently doing in China and other places, under the guise of "currency fluctuation adjustments."" No confusion, you said it. So you are saying the research I referenced too is wrong? Where is your data to back this up? I await it as I do many things from you. If you do not follow the figures how can you make such a comment as "Apple still sells too many devices; it shouldn’t have a market share bigger than 15-20% - that’s Apple natural client base". Can you see the contradiction, you say profit is everything, then suggest it sells too many phones. Then you quote a specific range, then claim you do not follow the figures. Worse you quote figures that Apple have not hit since 2012 (greater than 20%), figures that relate to world market share not just in the US. So I am 100% correct, unless of course, you can bring some actual data to the table to prove otherwise, your unsubstantiated comments do not count. I am yet to see Verizon and AT&T or republicans and "Tax Cuts and Jobs Act" in other country than US. Belgium never had subsidies; iOS market share (according to statista) was 38% in dec 2018, 37.98% in dec 2017, 38% dec 2016, 40% dec 2015. Finland (no subsidies until 2016): 29% - 2018, 31% - 2017, 28% - 2016, 36% - 2015 (pretty much the same value since 2013); as you can see, after Finland introduced subsides in 2016 iPhone market share was pretty much the same. Italy (limited subsides): 25.6% - 2018, 26.6.% - 2017, 26% - 2016, 27% - 2015. So, it is very clear that in developed countries (where the majority of Apple clients are) the performance of iOS devices has little to do with subsides. Yet another glorious example of you giving a pathetic, desperate response to simple questions. I said that in 2 out of 11 paragraphs, the US was the focus. one of those was the one using data for Verizon and AT&T. Try again. As you well know you were talking about the whole world when you quoted the 15-20%, not tiny countries like Belgium and Finland. Are you suggesting Apple sells too many phones in the US where market share has always been above way 20%, no of course not. So try again. We are talking about the world, not just tiny individual countries or more developed nations. China was mentioned many times in the article and it was a huge market for Apple, bigger than Europe and in 2015 bigger than the US, you ignore it. Subsidies clearly does have some effect as does prices, but you continuously keep saying prices have had no effect, against a wealth of information saying otherwise and giving NO evidence in return. BTW lies diversion and completely irrelevant is not evidence! When the title of the article has 2 us carriers, the ENTIRE ARTICLE is about us market; it might have info from other areas, but the bottom line is that it addresses us market. It’s not the size of the market (Italy is quite large, if you didn’t know), it’s the fact that those countries didn’t (or hardly) have subsidies and it is clear to see that Apple market share is not in any way major influenced by them (in Finland it actually lost 1% after the subsides were introduced). You should know that people in developed countries couldn’t care less about subsidies, because it’s easy to get a credit card with 0 interest for such purchases (I had 4, each with a limit larger than the price of a Max; I only used 2, paid them and closed them all but one - unused- after just a few months). I have not said price and no effect, I have said it had LITTLE effect in developed countries (read my messages again). Read the first 7 paragraphs they are clearly about world operations NOT the US market including the data used. Only 2 of the 11 paragraphs related to the US market. Are you really that stupid to claim a title is always an exact description of the article. Have you heard about "click bait titles" and are you one of the mugs that fall for it. No wonder you are almost always ill-informed, if you base your knowledge on a title rather than the body, it explains a lot about you though. Italy is tiny in relation to the big markets of China and the US, Europe as a whole made up less than 13% of total iPhone sales in 2018. Quoting counties with very small iPhone sales relative to the world shows your desperation not your knowledge. You need to learn from Steve Jobs, he made sure that the US carriers were an integral part of the iPhone launch because he knew they were essential to give the iPhone launch a jump start. Yes, people can use their credit cards, but interest on those is very high and contrary to what you say 0% interest is not permanently available. On PA the article follows the title (I don't read click bait sites). A credit card designed for shopping will always have 0 interest rate (wtf did you learned at your accounting school?!). Europe share is over 20% while China's is under 20% (there were 5% in favor of Europe before the closing of the fiscal year). I gave you 3 examples of countries WITHOUT (or limited) subsidies (if you know others, I'll check them out too) that prove the fact that the subside system has little to do with sales. Of course carriers are important but Apple's sales are driven mainly by Apple. No, it does not, explain to me how the first few pararaphs are not about Apples total business not just US. Explain to me how the concluding paragraph which is conveniently posted for you here, relates just to the US and does not support what I am saying? "When carrier subsidies go, the iPhone goes, it seems, and Apple has little recourse to offset that but actually lowering iPhone prices, which it seems to be perfectly aware of, and is currently doing in China and other places, under the guise of "currency fluctuation adjustments." China is a big example of what I am saying and this is supported by this article. It also has far bigger market for Apple than Europe. Look at the data for 2015-17 here - "https://www.businessinsider.com/apple-iphone-sale​s-region-china-chart-2017-3?r=US&IR=T". Or the Statistica data. You gave me 3 tiny markets which are of little consequence compared with China. By the way, credit cards are only 0% interest if you pay off the whole debt every month, if not you pay a very high interest rate on the whole balance. I did not have to go to any school or university to know that, it is common knowledge for all with half an ounce of general knowledge. You really make yourself look like an idiot making comments like that ....... yet again. If you do pay it off as it falls due you are not financing the phone over 1-2 years are you now!!!!!! It's useless to argue with a stubborn knows_nothing! "I gave you 3 examples of countries WITHOUT (or limited) subsidies (if you know others, I'll check them out too) that prove the fact that the SUBSIDE SYSTEM HAS LITTLE TO DO WITH SALES." Apple market in China was smaller than the one in Europe by 5%. There are credit cards with as much as 60 installments (5 years) of free interest; the world is bigger than US and the banks and financial services were invented by other nations ;). You are the one that knows nothing. I justify my statements, I gave you a link showing how Apple sold more iPhones to China than Europe, where is your evidence? Here is some more, look at this graph it shows Europe as a whole looking very insignificant, let alone minnows like Belgium and Finland, I bet you had to dig deep to find those.https://www.businessinsider.com/smartphone-sales-by-region-through-2020-2016-4?r=US&IR=T More data in 2017 the six biggest markets by country was 1. China 30% 2. US 12% 3. India 10% 4. Brazil 4% 5. UK 3% 6. Japan 3% Belgium has 11m inhabitants, Finland 5. In China the worlds biggest market sales have been falling so according to you subsidies must have made a huge difference I repeat those counties are tiny in terms of the phones Apple sell, it is no proof of what you are saying at all. For one the situation has to be looked at as a whole country by county not just rising sales as there could be many reasons; second, the sample size is just too small (as the data above shows). In this article, it says "Herein lies the crux of the matter. Throughout the most part of its existence as a product, the iPhone sales had a crutch in the form of carrier subsidies in its largest, most visible market of North America, but also in China and other places. It's no coincidence that the US is the country with the highest iOS adoption rate, where half of the smartphone users are rocking iPhones. In markets where carriers aren't subsidizing iPhones, Android handsets have been decimating Apple's finest for a while now when it comes to market share." If you had read the article you would know this. Maybe you can find credit cards with 5 years interest-free credit, I have never seen anywhere near that, yet it is far from the norm. I am not talking about the US (I am not American, nor do I live there), I am talking about in the world. You are just being ridiculous suggesting it is the norm to be able to get 0% interest for long periods on a credit card in a half practical way. Dude, that chart is for all the smartphone sales, not apple’s... Let’s go backwards: all the other countries - except those tiny 3 and USA - have had the subsidies system up and running in 2018 (some of the carriers - such as mine - got extra discounts from Apple, they always get discounts from Samsung - I could have gotten a Note for 600€, a Mate 20 Pro for the same cost) and yet the smartphone sales dropped this year. People could have bought their precious Notes, V, xz etc but they didn’t. Even though they had all the subsidies in place. How do you explain that? (what markets don’t subsidies iPhones anymore?) Yes, I live in the best place in the world. Here it’s strange to get credit cards without 12-24 installments for every purchase you make. If you cannot follow the conversation and understand the relevance of the data I post what is the point? It is no wonder you nearly always refuse to backup your statements with data, you cannot logically connect the two. "Let’s go backwards: all the other countries - except those tiny 3 and USA - have had the subsidies system up and running in 2018" Do they? How do you know? If you do show me the sources from which can make the statement. I guess you cannot. "People could have bought their precious Notes, V, xz etc but they didn’t. Even though they had all the subsidies in place. How do you explain that?" Easy, smartphones users are pretty loyal to the operating system they use (https://www.phonearena.com/news/iOS-Android-loyal​ty-Q4-2018-report_id113203), something I think you do agree. In the Android field there are lots of choices so they can switch to phones from other OEMs, China is a great example of this. Now IOS users only have iPhones to choose from. If they must have IOS they have the choice to carry on using the current model, buy a second or refurbished one or buy a new one. If they cannot afford to buy a new one outright, they have to opt for the first two. So you see price and fewer and less favorable carrier deals can and do have an effect on the number of new iPhones sold. The US and China are two examples where subsidies and carrier contracts have become less favourable, if you had read the article you are commenting on and my comments, you would already know that. Again, just because you claim you usually get interest free installments for long periods does not mean it is the norm in the world. Most people have to pay high-interest rates if they fail to pay the whole balance. "you nearly always refuse to backup your statements with data" That's because I don't give a crap if you believe me or you don't; everything I say is from public data that you can get by googling a little bit. Dude, "read my lips": EVERY FREAKING COUNTRY IN THE DEVELOPED WORLD - Germany, France, GB, (the entire EU), Japan, Hong Kong - HAVE SUBSIDIES FOR MOBILE PHONE PURCHASES, yet the market - the entire market - dropped; poor Xiaomi reduced further more its already small prices, it now sells through carriers all over the world and it still lost market share; why do you think is that, if the price is so f**king important for the user? Motorola/lenovo moves 3 phones a year, even though they are as expensive as a lollipop; I believe we are yet to see a Blu phone in the wild (we might not see one even if we check every phone in New York); anybody knows anything about Le Eco, Meizu; Asus passed 0.5%? No, because people hardly care about the cost of the product, they care however about what the product offers, that's why when you get one that suits your needs (such as iPhone, Note and Mate), you get the money to buy it (when you don't find it, you just keep your equally great phone you already have and laugh at the clowns that are saying you didn't get a new phone, because you didn't like the price). Utter rubbish, you have the audacity to accuse me of not putting down numbers, yet when I do you refuse to provide your own. Why because you are wrong. I will not say too much because I have just sat down and watched a video, by a well known Apple supporter who I do not always agree with but unlike you argues his point well.https://www.youtube.com/watch?v=RDLziHCsmkw Watch it, he not only clearly backs up what I am saying but uses extensive parts of Apples last earnings review featuring Tim Cook to back his view. It makes you look like the fool you are. He says price is a factor in the downturn of iPhones sales, but then says subsidies are an even bigger factor. In addition, in one sentence, he debunks your ridiculous "maths is everything in business" and gives the specific example of Japan as a country where subsidies are falling and it is affecting sales. Considering what you have just written and what you have posted before how the hell can anyone put any credence on what you say? Especially when you clearly lie and ask people to take your word without evidence. I do google, I do read, I do research every statement I make here. Happy viewing. An iPhone has a lifespan of 4-5y (compared to 2-3y for Android), which means one can easily buy an iPhone 7 - which is 500€ - and use it for 2y without problems. That is cheaper than the "flagship killer" OP. The more expensive iPhones are giving you more - 8 gives you inductive charging, X gives you OLED, Max gives you a large screen, XR gives you bigger battery etc. What's more - you must have seen it in the video - is that the margins on the new models are smaller, which means they pack more tech that is costing Apple a lot of money (the users gets more bung for the bucks): oled, haptic engines, 3Dt, true tone, HDR, better batteries, better antennas, water resistance, better software, better (and more) materials etc. You don't have to buy this year's model, as long as the one from last year is still great (my Air is 5y old; yes, the screen could be better - I love the retina in the Pro line - but, although it is 5y old, I can stick a 5k display and I'm all set at the office, I don't have to waste money on a new Air or a Pro). Have you caught Warren Buffet a few months ago, saying Apple devices are too cheap for what they offer? I did, and I tell you that's how an Apple user thinks (let's not forget that WB lives in the same house he bought tens of years ago and he's hardly known for wasting money on useless things). Rene Ritchie has said something I have heard a few weeks ago: "Apple hasn't been making iPhones more expensive, Apple HAS BEEN MAKING MORE EXPENSIVE IPHONES" (when a 2y old phone like 7 is going neck on neck with S9 at everyday tasks, you can see where all the money is). BTW, without subsidies, Apple's market share in Japan was 76% in Dec 2018 (71% iOS), from 66% in Dec 2017 (65% iOS) and 72% Dec 2016 (65% iOS). Not too shabby I would say and I would also say that iPhone was relatively immune to the shift in the Japan subsidies system, considering that in Jan 2019 it got over 78%. You are really missing the big picture with your rant about the prices, about shares, sales, market share etc. Apple products are ok, Apple users are ok and Apple is ok too. The only Android Oem that I have seen updating its phones more than 4y is... Xiaomi. There’s absolutely no prove that any phone was built for obsolescence, quite the contrary, Apple has made iOS 12 that works better than 11 (even 10) on older devices; they are more expensive to repair, because their parts are more expensive/higher quality; looking at the figures, we can see that at least 1/3 have a 2y old and older iPhone; if that makes you feel better... I’m sure that the Touch ID that Android had before 5s was a pleasure to use... Kirk McPike compiled the prices for iPhones and the chart he made shows how linear they are. A user doesn’t need to get the most expensive XS Max to have the best Apple experience, he can simply get a 32 GB 7+ or a XR and be all set; there is no “limit”, there’s only a wider choice of phones. Of course WB has been wrong numerous times, but he is saying the same thing I have said, Apple is saying and other smart people like RR. If you can make a more expensive product and charge less, tell me how and we’ll be billionaires together! AW4 is 50$ more expensive than AW3 was at launch and it is far from being a flop. I put the number for the market share in December, compared to the number for December of the previous year. Just getting updates for longer does not mean iPhones last longer the Android phones. Android phones are more advanced in both hardware and OS so do not need to catch up like iPhones do. I see many more old ANdroid phones than iPhones. There is clear proof Apple builds in obsolescence, they even admitted to it. In the article, you refer to the graph it clearly shows a non-linear price graph with a big jump in price from 2016, so supporting me, so I cannot see what you are getting at. Read my last comment proving you lied about what TC and RR said. At launch there were some basic AW's and really high-end ones in gold and with diamonds, they flopped, I was clearly not talking about the basic versions. You put the market share in December, compared to the number for December of the previous year, I did the same for the previous month which proved one month did justify your comment. Using a phone without support does not mean having longevity. “Android phones are more advanced in both hardware and OS so do not need to catch up like iPhones do” Gtf our of here, all the phones are able to Facebook, send/receive texts and run some games; wtf are talking about with your “advanced”?! Android can change an icon and use a custom launcher - big f**king deal... You’re just a liar, if you say Apple admitted to something that was never there. You must not have seen in that graph that the price of the iPhone in 2017 got to the same level - in 2018 $ - that it was in 2011. I don’t know where did Cook and RR said that the iPhone is too expensive... maybe you should have your head examined (and me too for trying to reason with you). Are you stupid enough to think that Apple has made those model, thinking they will sell in millions?! It’s like saying Patek Calatrava Pilot was a flop, because it only sold 600 pieces... Dude, maybe an accountant thinks things on monthly basis, but a ceo/investor thinks differently. Besides, apple’s market share in japan was never under 65% in the 2016-2019 interval.